Paytm - Get Rs. 750 Cashback on doing 15 UPI Transaction. This is absolutely loot offer for every user. Hurry up & avail the offer now. But make sure to follow steps perfectly. 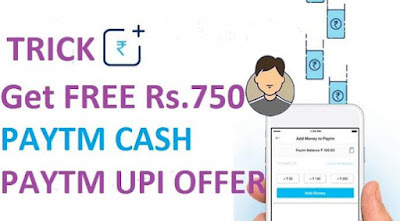 How to Get Rs 750 Cashback From Paytm UPI Cashback Offer? • Click on offer saying&nbsp;"5 Pe 50 UPI Offer on doing 5 transaction"
- Cashback will be credited to your Paytm Wallet within 24 hours of completing the offer.